Are You Ready For Some Comfort Food? Today we are making Carne Guisada. This Mexican pot roast will be braised in spices so that we end up with a beautifully tender roast that will fall apart under your fork. Here are a number of reasons why braising is a wonderful way to prepare a meal. You can use an inexpensive cut of meat. In this case it’s called chuck. Cooking it slow and low means tender and flavorful. Once you get all the spices and ingredients in the pot, the rest is on auto pilot. Put your feet up and take a break until it’s ready to serve. Clean up is a snap because you only use one pot. Well maybe two if you make some rice. The last and most important reason is taste. The flavor is amazing. The one thing I want to suggest you do when making this dish is to get all of your ingredients measured out in dishes so they are ready to go in the pot when you need them. That way when you are working with medium high heat, sauteing the onion for example, it doesn’t burn because you are gathering your other ingredients. So get all your ingredients measured out, vegetables chopped, and your garlic minced. You will appreciate it later. 1. It will seal in the juices of the meat. 2. Creates a brown crust that sticks to the bottom of the pan, creating what is called fond. Fond is little bits of meat and juices stuck to the bottom of your pan where great flavors are born. You will use a technique called deglazing to get these stuck pieces off the bottom of the pan and into your sauce. All you have to do is add a little liquid (wine, broth, lemon juice) and stir or scrape the bottom of the pan. I also want to mention the chipotle peppers in this pot roast. In case you are not familiar with them, they are smoked jalapeno peppers. They are very hot, so add them according to your tastebuds. I don’t like things terribly hot but I do like that smokey flavor they give, so I use one pepper in my carne guisada. I also try and remove most of the seeds where a lot of the heat resides. So if you don’t like much heat try one small pepper and you will be fine. Now let’s get dinner going. Before we start: You do have all your ingredients measured out and prepared, right? Good, now we can begin. Use a heavy stock pot or dutch oven with a tight fitting lid. Add 1 tbsp. of oil and heat over medium high heat. Salt and pepper the roast on one side. Use a spatula and press the salt and pepper into the meat. Fill a platter (big enough to hold roast) with 1/2 cup of flour and spread it out. Place the roast, salt and pepper side down into the flour. Salt and pepper the second side of the roast and then turn it over to coat with flour. Coat the whole roast. When the oil is hot, carefully place the roast in the pot to sear. Searing the roast will lock in the juices and form a crust on the roast creating those nice flavors. Let the roast sear for about 2 1/2 to 3 minutes on a side. Don’t move it around at this point. Then turn the roast over. I found it easy to turn the roast over with two sets of tongs. After you have browned all sides of the roast, place it in your stock pot. At this point you will notice some nice brown carmelized bits of meat and juice stuck to the bottom of the pan. That’s the fond I was telling you about. With the temperature still on medium high, add the onion, and saute for about 5 minutes. Then add the chipotle pepper and cumin and saute for 1 minute. Now add the tomato paste and stir frequently for a minute or two. Since the tomatoe paste has a fair amount of sugar in it, it will carmelize and turn a dark red brick color (more delicious flavor for our carne guisada). Add the garlic and stir 2 minutes. Now it’s time to deglaze. Pour 1/2 cup of wine into the hot pan and stir and scrape to help losen the bits of meat etc. which have stuck to the bottom of the pan. 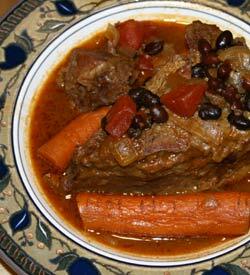 If you wanted to use a crock pot, this is the point I would put this mexican pot roast into one. Put the lid on, bring this to a boil and then lower the temperature to low/simmer and relax. Cook the stew for at least 3 hours and it won’t hurt to go longer. Notice the wonderful aroma filling your house. Your carne guisada will be done in 3 to 3 1/2 hours. I’m serving mine with refried beans and cilantro lime rice in flour tortillas. Yummy. Click here to watch my Carne Guisada video on YouTube.